Staff Sgt. Christopher N. Piper, 43, was born Dec. 20, 1961. 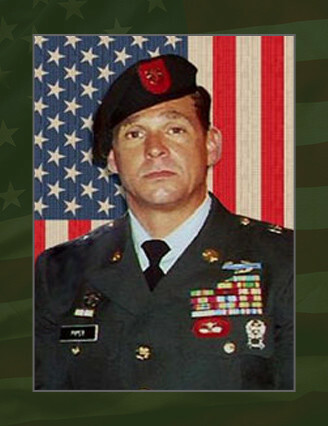 He was a Special Forces communications sergeant assigned to 1st Battalion, 7th Special Forces Group (Airborne), at Fort Bragg N. C.
Piper died on June 16, 2005, at Brooke Army Medical Center in San Antonio, Texas, from wounds sustained when an enemy Improvised Explosive Device exploded near his Ground Mobility Vehicle June 3, 2005, during operations in the vicinity of Orgun-e, Afghanistan. A native of Marblehead, Mass., Piper graduated from Marblehead High School in 1980. Following graduation he entered the Marine Corps and attended training at Parris Island, S.C. While serving with the Marine Corps, he deployed to Beirut, Lebanon as a scout sniper from February through October 1983, eventually becoming a regimental scout sniper. In 1983, he left active service with the Marine Corps and joined the Marine Corps Reserves. He entered the Army, April 17, 1995. After numerous assignments, including service with 20th Special Forces Group (Airborne) and Headquarters, U.S. Army Special Operations Command, he arrived to 7th SFG (Airborne) in September 2004. His awards and decorations include the Bronze Star Medal for Valor, the Bronze Star Medal, the Army Commendation Medal, the Navy Achievement Medal, the Navy Unit Commendation, the Good Conduct Medal, the National Defense Service Medal, the Iraq Campaign Medal, the Global War on Terrorism Service Medal, the Armed Forces Reserve Medal with “M” Device, the NCO Professional Development Ribbon, the Army Service Ribbon, the Navy Sea Service Deployment Ribbon, the Special Forces Tab, the Combat Infantryman Badge and the Parachutist Badge. He was posthumously awarded the Bronze Star Medal, Purple Heart, the Meritorious Service Medal and the Afghanistan Campaign Medal. His wife, Connie, survives him. His two children, Deirdre Margret and Christopher Thomas and their mother, Colleen Egan-Piper of Marblehead, Mass. survive him as well.